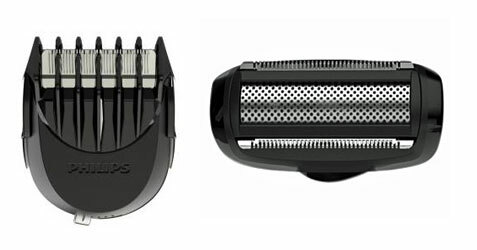 With the new Philips Norelco Click & Style, you can get a super-flexible electric shaver that can handle all your grooming needs. If you’re smart about your grooming habits, or have a girlfriend or spouse that speaks her mind, you understand that in today’s world a simple daily shave usually won’t cut. With the new Click & Style, regardless of your preferences (or her preferences! ), you’ll have one handy tool that can help you take care of business. The Click & Style is a complete all-in-one system equipped with three attachments that are easy to click on and off for shaving, facial styling, or bodygrooming with a single product. We tested all of them and the ease of use was impressive. The two-headed shaver with ComfortCut blades gives you the close shave that you can expect from Norelco products. If you’re into some stubble or more growth instead of the all-clean look, you can snap on the beard styler with 5 lengths for the perfect stubble or a neatly trimmed beard. Finally, the skin-friendly bodygroom shaver gives you the flexibility for a close and comfortable shave or a trim on all areas below the neck. The “skin-friendly” feature is critical – we’ve tested beard trimmers in the past that are a real problem if used directly on the skin! The Philips Norelco Click & Style also features 100% waterproof technology so you can trim, style and shave wherever you want in wet or dry settings. So if you shave in the shower, you can use this there as well. If you travel a lot, you’ll appreciate the convenience of having one tool that addresses all your grooming needs even more. Our only quibble with this unit is that it doesn’t come with a carrying case. With Father’s Day around the corner, this can be a great gift for the right dad who can appreciate such a powerful grooming tool.